The recipe in its normal size can be cooked in pot on a grill’s side burner or the stove top. Thanks to inspiration from a post on the Family Fresh Meals blog, I’ve switched to making this meal in my slow cooker—perfect for my downtown, no-outdoor-space, Topeka apartment. I use my version of Emeril Lagasse’s Essence seasoning to give the dish its zip, but you could also use Old Bay or any other seasoning of your choice. 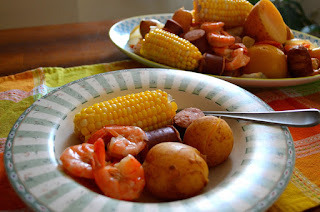 Creole Shrimp Boil is simple to make, so it works as a weeknight family meal as well as one for a weekend gathering. Yes, you can serve the boil on a large platter or in a bowl, but at least once try dumping it onto the table. You’ll create an instant memory. In a large Dutch oven or soup pot, add the beer, water, and Creole seasoning. Whisk to combine. Cut the lemons in half and squeeze the juice into the pot. Add the lemon halves, garlic, onion, and bay leaves. Bring to a boil, and then reduce the heat and simmer for 10 minutes. Add the potatoes and simmer for 15 minutes. Then add the corn and sausage. Simmer for another 10 minutes, or until the potatoes are almost tender. Add the shrimp, cover the pot, and simmer until the shrimp is just done, about 5 minutes. Strain off the liquid from the pot, or remove the ingredients using a slotted spoon or strainer. 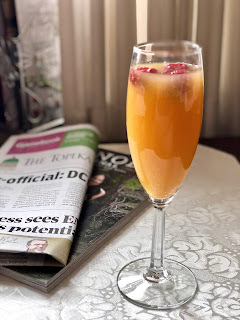 Pour the ingredients onto the middle of a table covered with newspaper or parchment paper, or serve on a large platter. Sprinkle salt over the top, to taste. Serve with cocktail sauce and butter. To make in a slow cooker: Add the beer, water, and seasoning into the slow cooker. Whisk to combine. Cut the lemons in half and squeeze the juice into the pot. Add the lemon halves, garlic, onion, bay leaves and potatoes. Cover and cook on low for 4 hours. Add the corn and sausage pieces. Cover and cook for an additional 2 hours. Increase the heat to high and add the shrimp. Cook for another 30 minutes. Serve as above. 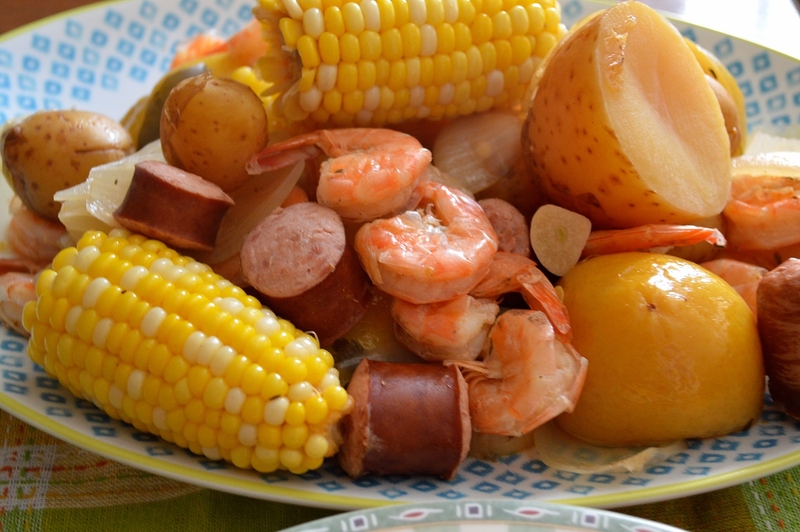 I would LOVE to sit down to a table filled with this Shrimp Boil!! I'd love to make this meal someday. I've been to a Shrimp boil but never taken on the task myself. Pinned. It is so easy, Lea Ann. Enjoy! This is just plain old fun, Linda. Adore it. Happy June and best wishes with the writing workshops! I made this last summer, and it received rave reviews. 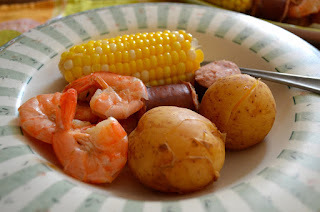 I am making it again for the July 4th celebration.